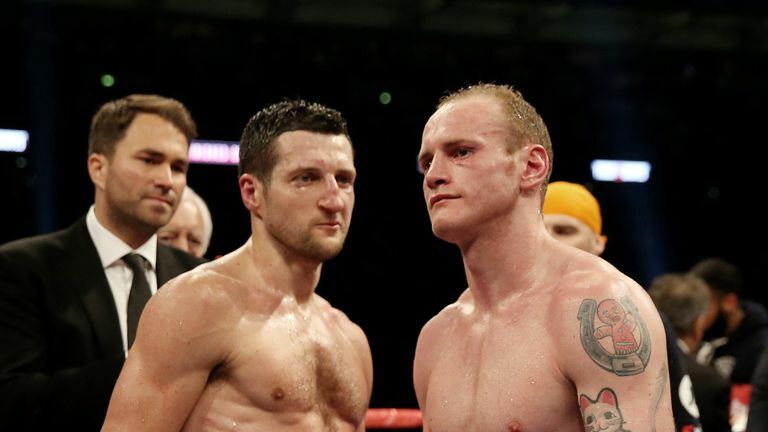 Carl Froch says he can understand George Groves' decision to retire and looked back on their world title fights. Carl Froch might not be George Groves' best friend, but he believes it was the right time for his old foe to call it a day. I am not surprised George Groves has retired and it makes complete sense to me. Yes, he fulfilled his dream by winning a world title and you can't take that away from him. Will I miss him? Probably not. But I can't deny that Groves made a massive, positive impact on the end of my career. Between us we filled Wembley and raised the bar for the next generation, led by Anthony Joshua of course, to box there, regularly. "I was happy to stand up and applaud him, he'd won a world title at the fourth attempt. Seeing anyone fulfill their dream is nice, even if they are not your best mate." Groves certainly played his part in all that. A big part. He will be remembered for all those mind games and smart words he came out with, but I have to be honest, I never found him funny or clever. I could talk about what happened in the fight at Wembley, but you all know... Everything for a reason. What I will say about him though is well done for becoming a world champion. Even if I was not his biggest fan, I was glad to stand up and applaud his win over Fedor Chudinov at Bramall Lane. I do remember thinking he started off well and went for it, but then started to fade. But he bit down on his gum-shield and picked the pace up. He took it to Chudinov with a heavy assault of hooks and combinations and got the stoppage. I was happy to stand up and applaud him, he'd won a world title at the fourth attempt. Seeing anyone fulfill their dream is nice, even if they are not your best mate. But I won't miss him and I am not sure that British boxing will miss him, these days at least. There was nothing left out there for him. He lost to Callum Smith, who is now top of the super-middleweight world and it wasn't like it was a close or controversial defeat, he was conclusively beaten and there was never going to be a rematch. Smith is now in the new super-middleweight scene, where the champions are big, strong, young and fresh. I just can't see there being anything out there for Groves to bother with. Yes, he could wait around and fight the winner of James DeGale and Chris Eubank Jr, but what is the point? He's just beaten Eubank Jr and the first fight with DeGale was so long ago, I am not sure even George could get up for that. Smith to miss out on Anfield? Groves helped me finish my own career in the best way possible, so now it's his turn to call it a day. Fair play to him.